You are about to move from Philadelphia to New York and search for a reliable relocation company? You are at the right place, then. Great Nation Van Lines is a fully licensed, bonded and insured moving company with 12 years of experience and thousands of satisfied customers from all over the United States. We have earned top reputation through our professionalism, hard work and eye for the detail. We prepare carefully for every single move so nothing is left to chance with our services. New York City – The Big Apple, The Capital of The World - the most populous city in the United States goes by many names and you are probably eager to become a part of it. Even though NYC is just less than a hundred miles away from Philly it surely feels like a different galaxy. The dynamic of New York City will never fail to amaze you – life there is just happening around you without a break. After you spend some time in NYC, you start to understand why people refer to it as The City That Never Sleeps. There are so many things to see and to do in New York, so many new experiences and memories, waiting to be made. 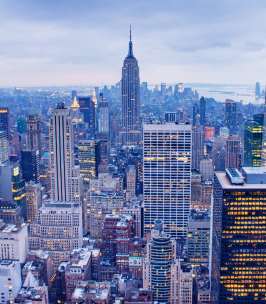 But first things first – before you start exploring the amazing sights of NYC, you will need to make yourself familiar with some even more important things like the cost of living. When you finally move from Philadelphia to New York you will find that the prices in The Empire City are much higher. The average cost of living is about 22% higher with the differences in rent prices reaching 50%. It is probably good for you to know that having a car is one of the most expensive things for New Yorkers but you can always rely on New York City’s extensive and reliable transportation system. It doesn’t matter what your passion is– photography, fashion, music, theatre, sports or world cuisine – it is almost a certainty that New York is often referred to as its home. For example, there are more than 40 professional theatres in Broadway, around 110 universities and colleges and almost 500 art galleries of all sizes. Just take your time and embrace the change in your life while we take care of every single step of the relocation process – from evaluating and packing, through loading and transporting to unloading and unpacking your household goods. Why Choose GN Van Lines For Your Relocation? We work faster, smarter and more efficient than the other moving companies. Same day delivery in more than 90% of the moves. We make use of the latest relocation equipment and up to date moving techniques - so that we are able to take care of every job, no matter how complicated it is. We care for you and your belongings – because the only way to measure our success is by the happiness of our satisfied customers. Best Price for the service - guaranteed! For an accurate estimate of your interstate moving cost, you can fill out our FREE quote or just give us a call at 800-403-7552. One thing is for sure – you will never pay over the odds for our services. At Great Nation Van Lines, we understand your needs, your fears and all of the moving related stress factors. That is why we are so good at our job and have a rock solid reputation. Check it out for yourself, now! Moving is hard? Well that is simply not true, with the experience movers at Victorianism I was able to move all of my belongings in just one. My move was from NYC to Washington DC so I needed good and professional Washington DC to NYC movers and Great Nation Move didn't let me down. Thanks for the perfect move! Use the following links to navigate quickly through our website.